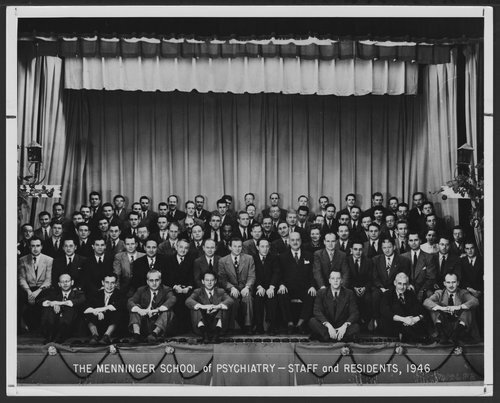 This black and white photograph shows the staff and residents in 1946 in the newly formed Menninger School of Psychiatry. In 1946, Dr. Karl Menninger convinced Arthur Marshall, the envoy from the Veteran's Administration, on the concept of establishing a model training program in Topeka, utilizing a former Army hospital as the flagship VA hospital for the Menninger School of Psychiatry. Drs. Karl and Will Menninger assembled a faculty and went to work. The first class numbered 108 physicians, and overnight the Menninger School of Psychiatry became the largest training center in the world. Training of psychologists and social workers followed. Nursing education also received significant attention. In those postwar times, five to seven percent of all the psychiatrists in the U.S. and Canada were trained at Menninger. The major contribution of the school was a greater commitment to a didactic curriculum, a team approach to diagnosis and treatment, and a model of diagnostic case study outline, elaborated by Dr. Karl in his "Manual for Psychiatric Case Study," that initiated a broad-based approach to diagnosis. This black and white photograph shows the staff and residents in 1946 in the newly formed Menninger School of Psychiatry. In 1946, Dr. Karl Menninger convinced Arthur Marshall, the envoy from the Veteran's Administration, on the concept of establishing a model training program in Topeka, utilizing a former Army hospital as the flagship VA hospital for the Menninger School of Psychiatry. Drs. Karl and Will Menninger assembled a faculty and went to work. The first class numbered 108 physicians, and overnight the Menninger School of Psychiatry became the largest training center in the world. Training of psychologists and social workers followed. Nursing education also received significant attention. In those postwar times, five to seven percent of all the psychiatrists in the U.S. and Canada were trained at Menninger. The major contribution of the school was a greater commitment to a didactic curriculum, a team approach to diagnosis and treatment, and a model of diagnostic case study outline, elaborated by Dr. Karl in his "Manual for Psychiatric Case Study," that initiated a broad-based approach to diagnosis.